CBN Selector 3.07.09.25 free download. CBN Selector is a useful application that will re-color your images. CBN Selector is a useful application that will re-color your images. CBN Selector is a useful application that will re-color your images. 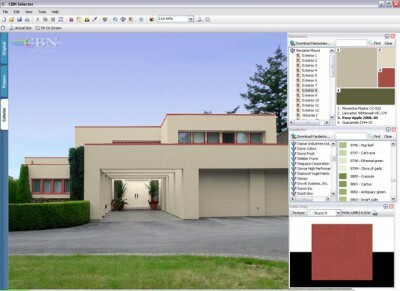 For example, you can see what your home interiors and exteriors might look like any virtually any color. Try countless designer created schemes and harmonies, apply colors cross-referenced to paint chips, or even create your own custom colors by using CBN Systems' advanced 3D color palette. Then, apply your color selections to your digital image. Recolor, specify, manipulate, visualize, color pick, harmonize, share, communicate, and design your colors with CBN Selector color management tools. CBN Selector maintains amazing photo-realism of your digital image even while re-coloring - preserving textures, subtle shadows and lighting. CBN Selector also includes a paint quantity area calculator to assist with job estimation. Try this premium color application for color visualization, management, communication, conversion, and specification. CBN Selector releases your creative potential by giving you an extremely powerful, but easy-to-use, graphics program. In your own photos, visualize colors in the complete spectrum of the digital environment (tens of millions of colors). CBN Selector is fantastic for specifiers, manufacturers, and resellers, allow them to easily help their customers "see what it will look like". CBN Selector helps ensure you will love the color that ends up on your walls and have fun doing it. Your imagination is the only limit! Visual Color Picker is very easy to use and powerful RGB-HSV-HSL-CMYK-HEX color selector. RGB Color Selector will help you convert RGB to Hex and Hex to RGB in simple way. Never be curious about any color you see on your screen. With EG Color Hex you will be able to converts any color into its hexadecimal value and Delphi name. Hyper Color is a powerful color chooser for the Webmaster who wants to take their web design to new limits. Color Scheme Designer is a simple tool that allows you to create advanced color schemes for web or for multimedia. ColorWrite is able to convert color specifications between RGB, CMY, CMYK and HSV. Color Picker is a small tool great for choosing a color. HoverMatch is a utility designed to allow desktop customizers to modify exiting themes and skins to their tastes by altering an images Hue, Saturation and Brightness values and saving the results. The basic algorithm placed into the heart of it allows to get practically unlimited quantity of complex textures in a minimal amount of time. Picture-shark is the best solution for people who want to "stamp" visible text or logos on their image files. PictureClip takes a Bitmap image file and sections it out evenly into separate files so that you can make a new menu for your website. PhotoEdit is a powerful photo editor, its source code is available, it can read, write, and manipulate an image in many image formats (over 38 major formats) including popular formats like TIFF, JPEG, PNG, PCD, PIC, PSD, and GIF.